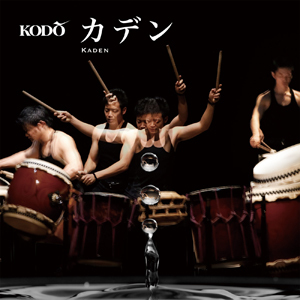 ﻿ [Kodo Online Store in English][CD] Kodo "Kaden"
All Items > CDs > [CD] Kodo "Kaden"
Item Name [CD] Kodo "Kaden"
"Kaden" features nine unique compositions that were created especially for four recent “Kodo One Earth Tour” productions directed by Tamasaburo Bando: Legend, Mystery, Eternity, and Chaos. The tracks were captured with the latest high-resolution audio technology in a recording studio, allowing even the subtlest tones to interweave in unprecedented ways. Like a brand-new theater performance, this album creates a world of sound that promises to captivate and delight. The album opens by showcasing the various tones of a newly developed, award-winning tunable taiko, Kanade. Melodic bamboo flutes float in to transport listeners to that fleeting realm between day and night. Later, an ensemble of high-pitched shime-daiko enters with a parade of sound, which leads to a powerful match between two mighty opponents: the o-daiko (big drum) and a Western drum kit. The climax is the monumental title piece, Kaden, a modern oeuvre featuring six performers playing twenty drums.